This is a gameplay trope where a weapon or other piece of equipment can be altered in order to conform to a higher standard, making it more useful to the player (or to put it more simply; upgraded). This might be done through a temporary Power-Up, a permanent Upgrade Artifact as a reward for a Side Quest, or through a specific "weapon upgrade" mechanic. The upgrade could be linear (e.g. "Weapon v1 is upgraded into Weapon v1.5") or branching (e.g. "Armour A can be upgraded to Armour Aa, Armour Ab or Armour Ac"), which might itself be spiced up with a Mutually Exclusive Powerup or two. The upgrades could be optional or required to progress (or a mixture of the two). Conversely, they could be automatic, and used to reward the player as they progress. In this context, "upgrade" only means an upgrade in terms of gameplay, not flavour or story. So, switching out different pieces of equipment, even if they're upgrades In-Universe, doesn't countnote Switching out parts on a piece of equipment would qualify, but belongs on one of the subtropes mentioned below (e.g. if the Player Character always uses the same sword, but can equip different accessories for it instead of different weapons). Conversely, something which wouldn't strictly be considered an upgrade in Real Life can still be treated as an upgrade by the game's mechanics (e.g. picking up a second pistol to "upgrade" a Little Useless Gun into Guns Akimbonote Apart from the rare occasions where the Dual Wielded pistols are treated as separate weapons to the single pistol, of course). From the player's perspective, upgrading their equipment can be used to reward them or give them a sense of progression (especially if the game uses Equipment-Based Progression). It can also be used to make older gear with a specific purpose useful later in the game without giving the player a Disk One Nuke (e.g. infinite ammo for a weaker weapon so it can serve as an Emergency Weapon or a damage upgrade for an elemental weapon so it isn't outclassed by later ones, preventing Elemental Tiers). This is helpful when the Sorting Algorithm of Weapon Effectiveness is in effect, but enemies have specific weaknesses to different weapon types. It can also be used as part of a Double Unlock (first you have to quest for the Penultimate Weapon, then you have to quest to upgrade it into the Infinity -1 Sword). Design-It-Yourself Equipment — The logical result of a non-linear upgrade system. Evolving Weapon — The upgrading is done by "levelling up" a weapon like a character rather than modifying it. Socketed Equipment — Adding bonus-giving items to "slots" on the equipment. Compare Item Crafting and Just Add Water (which involve creating equipment, although either or both of the two can overlap or co-exist if lesser equipment is used as an "ingredient"). Temporary upgrades overlap with Power-Up. If the equipments' models change, you can expect that Elaborate Equals Effective. For upgrading your character via equipment, see Equipment-Based Progression. Cave Story has (in addition to each weapon being an Evolving Weapon) a sidequest which allows the player to upgrade the Polar Star into a powerful charging weapon with infinite ammo (assuming they didn't trade it away). Tomb Raider (2013) features weapon upgrades on two levels; individual abilities and improvements, which can be bought with "salvage", and upgrades which unlock new abilities to buy, which are found by collecting "parts" or given to you at plot-specific moments. In Bastion, weapon upgrades can be bought after finding the right amount of the relevant collectable for that weapon (which follow a "Something [adjective]" naming pattern). Each weapon has five stages with two upgrades that the player can switch between after unlocking that stage. The Legend of Zelda often has sidequests where equipment can be upgraded, the best examples being The Legend of Zelda: A Link to the Past and A Link Between Worlds, which both have multiple upgrade sidequests for the sword (after the Master Sword is picked up it can be sharpened and tempered) and fairies who upgrade other equipment. 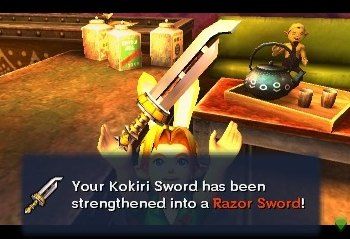 Skyward Sword includes an Item Crafting shop where nearly every secondary weapon and item can be improved using Random Drops from enemies, and improving the Goddess Sword into the famous Master Sword is a large portion of the quest. Of course, every step along that pathway also improves damage dealt. Breath of the Wild lets you upgrade your armor at Great Fairy Fountains provided you have the right materials. In BioShock (and BioShock 2), you could find "Power to the People" stations. Each station allowed one upgrade to be applied to an existing weapon (e.g. larger magazine, more damage) with a corresponding change to its model. The Engineer class in Team Fortress 2 is based around placing and upgrading various buildings to support their team (most notably the sentry gun; an automated gun which goes from a knee high machine gun to a dual minigun/rocket launcher platform). In the Mann vs. Machine game mode, the robots drop money that the players can spend to improve their weapons, increasing attributes such as fire rate and damage, or adding new attributes such as bullets that pierce through enemies. In Unreal I, the very first weapon acquired in single player mode is an energy pistol with constant ammo regeneration. It can be permanently upgraded several times with missable power-ups, its projectiles changing colour and becoming more damaging at the cost of a slower rate of fire and ammo regeneration. Still, that gun is so weak that in multiplayer, players wield a different pistol by default. In Left 4 Dead, the pistol, which everyone starts with, can be "upgraded" to Guns Akimbo by picking up a second one. In Medal of Honor: Vanguard, the player can find 50 round magazines for the M1928A1 Thompson and a scope for the M1 Garand, which converts it into an M1D Garand. Medal of Honor: Airborne takes this Up to Eleven, with virtually every weapon in-game getting an upgrade, such as the Thompson going from a wartime production version to the gangster version, or the M1 Garand getting a Rifle grenade launcher in addition to adjustable sights and and improved firing rate. Overload has upgrades for all of the weapons (a basic upgrade and one of two possible super upgrades) as well as for the ship itself, with the latter including upgrades such as those reducing incoming damage and increasing the speed. Elsword: Upgrading equipment also increases the bonuses from socketing them. FlyFF: Weapons and body armour can also be pierced to socket cards into. In Disgaea, all items (even consumables) can be upgraded by going inside their "item world" and clearing levels of it (as well as rescuing "innocents" - NPCs which raise the items' stats). The Infinity +1 Sword for each character had to be upgraded twice (by finding its corresponding Upgrade Artifacts and taking them to the right place) to unlock its full potential (with the added bonus of upgrading one of Yuna's Aeons). "Brotherhood", the sword Wakka gives Tidus near the beginning, is upgraded part way through the game, when Wakka talks to his brother on the Farplane. In Dragon Age II, rather than changing armor, your party members merely improve on the stats provided by their outfits by picking up upgrade components. In Eternal Eden Fierro's nun-chucks are improved by upgrading them with Bravestones. In Monster Hunter, weapon upgrades become available once you've unlocked the relevant tier and own at least one required material. Kingdom Hearts: Birth by Sleep's "meld" system fits the trope in spirit by allowing more powerful abilities and moves to be created by combining other moves with each other. In God Eater Burst, All non-clothing equipment is subject to Elemental Crafting. In order to make the upgrade for a given piece of equipment available you must have the materials needed to craft it. Chrono Trigger sees the Masamune upgraded from the Sword of Plot Advancement to Frog's Infinity +1 Sword when it's full potential is unlocked towards the end. Dungeon Crawl features scrolls of enchant weapon and enchant armour, which improve item's attacking or defensive capabilities respectively, scroll of vorpalise weapon to make a temporary brand (flaming, freezing etc.) permanent, and The Shining One and Kikubaaqudgha will permanently brand one weapon with holy wrath and pain respectively at the highest piety level. In addition to scrolls, which work similarly to the previous entry, Ancient Domains of Mystery allows the player to upgrade weapons and armour through the use of Smithing skill. Heavily smithed items can sometimes surpass artifacts in their efficiency. Path of Exile utilizes both this trope (in terms of either directly increasing basic offensive or defensive stats or granting random magical properties) and Socketed Equipment to almost infinite upgrade possibilities. Lunarosse applies this only to weapons, not armor. Twice, you'll need to get some unobtainium to keep boosting them. Aveyond 4: Shadow of the Mist applies this for Boyle's staff and Phye's sword. Boyle can increase the magical capacity of his Corrupted Will by trading in Darkness points obtained from collecting Cheekis. Phye's Warmonger grows stronger when it absorbs the blood of demons. Several Might and Magic games allowed enchanting non-magical items (of sufficient value, so it couldn't be done on the cheapest crap or stuff that can't be sold) with a random enchantment. This wasn't necessarily an upgrade in actual power, but it did increase the price of the item (especially with the least power-relevant enchantment — making it antique). Resident Evil 2 lets you upgrade Leon's weapons. The VP-70 can be upgraded to fire in bursts with a stock, the Magnum gets an extended barrel, and the shotgun is converted with a barrel and stock. The VP-70 and Magnum upgrades are actually fairly realistic. In Resident Evil  Code: Veronica, the pistol you find near the beginning of the game can be upgraded if you find the parts for it and take them to a workbench at the right point in the game. In Resident Evil 4, all of Leon's guns can have various upgrades purchased from the merchant (most even have a "special" upgrade which becomes available when all the others have been bought). Dino Crisis gives you three weapons — a handgun, a shotgun, and a grenade launcher — and each of them has two enhancements, usually boosting their damage output and rate of fire. In Warframe, Orokin catalysts and reactors can be installed on weapons and warframes (and companions) respectively to permanently double their mod capacity. Once you reach rank 30 with them, you can also install a forma to change the polarity of their mod slots, potentially giving more room for more powerful or numerous mods. After completing The Second Dream, you can install lenses on rank 30 equipment to turn excess Experience Points into points used to unlock unique abilities. After Fern kills the Kidney Stone Mother with a poisoned stick to the eye, the stick gets spontaneously upgraded with a razor-sharp coating of mineral secretions. It also absorbs the Mother's concept core and becomes a subtly Empathic Weapon that comes to approve of how Fern wields it. Later, a character imbues a bit of her own power into the kidney stone blade after offering Fern a selection of upgrade features, and tells her to come back for more upgrades after gaining a few more Character Levels.